Here are some simple exercises that you can use in your practice routines. Bear in mind that these exercises can also be used as slow progressions or warm-up pieces. They follow the classic Circle of Fifths pattern and will not only help you to memorize the pattern from which we get 5-1, 2-5-1, 6-2-5-1, and other progressions, but will also help you to realise the power of using inversions - i.e. how you play a chord. But, we need to cover just a little theory first. It is important to note, that we choose to follow the Circle of Fifths pattern going anti-clockwise. That is, C –> F –> Bb, etc. If you’re not already familiar with the Circle of Fifths, don’t worry … you can still practice these exercises, as I will actually spell out each chord for you, later on, below. Simply put, the Circle of Fifths organises major and minor scales according to how many sharps or flats each scale contains. When you first began playing the organ, you may have thought that C and Db were more related to each other than perhaps C and F because of how close the two notes appear on the keyboard… but that is not true. If you really think about it, how many notes does the C major scale have in common with the Db major scales? …..... an amazing two notes (namely F and C) in common! In the next Reply, we explore this particular close relationship. F major has a Bb instead of B.
F major and Bb major have the same notes except for one difference: Bb major has an Eb instead of E. And that pattern continues all the way round the circle. If the major scales of C and F are similar, then isn’t it safe to assume that their major chords are similar? In fact, to play from a C major to an F major triad (three-fingered chord), you don’t even have to change your hand position. (notice the C’s don’t change). If you really look closely, the Fmaj9 actually has a Cmaj triad inside of it. If you locate C, E, and G in the second chord above, then you’ll notice exactly what I mean. Appreciate that there are relationships all throughout this circle! In the next Reply we see what this means. … So What Does This Mean? Well, this simply means that you can go round the ENTIRE circle with these types of close relationships not having to change more than a few fingers from one note to the next. … and instead of going to F A C E (which is an Fmaj7 in root position), you’re going to go to the closest inversion of the Fmaj7. Remember, - An inversion is another way to play the same chord. So which inversion would work best coming from a Cmaj7 (C + E + G + B) ? Of course the C + E + F + A because your lowest note is already on C! So, in fact, we’re just picking the closest inversion of Fmaj and in this case, it happens to be C + E + F + A. A few tricks: You need to read this carefully! When you’re playing a root inversion of a major seventh chord (root inversions always put the name of the chord on the bottom… so Cmaj7 played C E G B is in its root inversion because C is on the bottom). Now simply move the top two notes down one whole step and you’ll be on the next chord of the circle! Now to get from the Fmaj7 to the next chord on the chart, which is Bbmaj7 simply lower the bottom two notes by one whole step. …. and now, you simply follow the first step by lowering its highest two notes down to get to the next chord......and so on. Don’t worry if you don’t understand these steps yet. Just re-read this post and it’ll make sense soon! If not, just skip down to the actual chart below and play EXACTLY what I’ve listed in each box. There’s no way you can go wrong. Make this your first exercise. Let me warn you: The first time, you’ll be doing a lot of thinking (high two, low two, high two, low two) but as you get better and better, you’ll build speed and you’ll know which chords come next on the circle. In the next Reply, I spell out this exercise for you. Here’s the first exercise, playing Major 7ths, chord for chord. In the next Reply, we have another exercise with Major 7ths, but voiced differently. If you play these chords softly, as you transition from one to the other, you’ll notice very nice progressions that you can use in songs, accompaniments, and for warm-up. In the next Reply we look at an exercise using minor ninths, and the Circle of Fifths. In the next reply we supply some additional ideas for you. 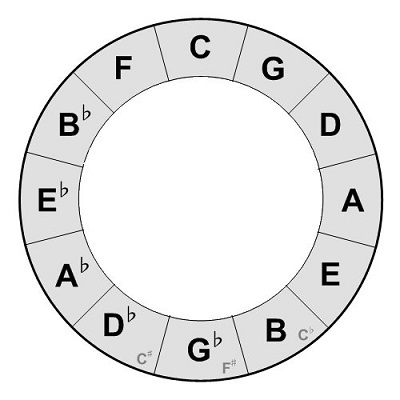 Now that I’ve given you just three ideas of what you can do with the circle of fifths, it is your turn to use this process to practice all chord types. Remember, there will always be a connection between one note on the circle and the next so it is your job to find that connection! For example, C maj to F maj will connect somehow and you’ll never find yourself having to move all of your fingers — yes it's true! If this has helped you, or given you something to think about, please let us know in a Reply below. If you want to change the Key, then click on the Tonic column, selecting the particular Key you want.